"On that day, I became the enemy's possession," Nakaba thought as she stood there, knowing her destiny was to be married for convenience to keep the peace between her country Senan and Prince Caesar's country, Belquat; two neighbor countries on an island. Between the two countries there has been a constant war for 200 years and Nakaba has become a sacrificial lamb for her country despite the discrimination against her red hair and the sub-person (half-human, half-animal) Loki, who is her only friend and attendant at Caesar's estranged palace. But what will Nakaba do when she foresees an event pertaining to Prince Caesar's demise? Will she save him, or let him die in return to all the hate directed towards her by the people of Belquat? Note: Chapter count includes extras. 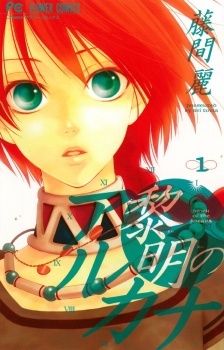 Reimei no Arcana was published in English as Dawn of the Arcana by VIZ Media under the Shojo Beat imprint from December 6, 2011 to September 2, 2014. Reimei no Arcana is a fantasy shoujo manga by Touma Rei, totalling thirteen volumes. We begin our tale at a wedding ceremony, the participants a red-haired girl and a black-haired boy. The girl notes dispassionately that her new husband has crushed her hair in his hand, unbeknownst to the onlookers. This is a marriage of convenience, for the purpose of upholding a treaty to keep the peace between two warring countries, Senan and Belquat. Not only is she of a different nationality to the prince she has married, which automatically makes her unlikable, but she also has filthy, red hair. Why is red hair so bad? Only commoners have red hair, of course. The manga is set in a medieval fantasy world where those of royal blood have black hair, whilst merchants, servants, and other common folk have other colours in their glossy locks. Not only is it scandalous for a royal to have a hair colour other than black, it is also nearly unheard of. Why would anyone of the nobility want to sully their name by reproducing with someone of a different hair colour, after all? It’s even worse when you throw “ajin” into the mix – also known as “sub-humans”, people with animal characteristics are shunned by society and considered worse than second-class citizens. It is in this crazy world of discrimination and hatred that we meet our main protagonists. While the story isn’t very original (I am certain you have heard of political and arranged marriages before), it redeems itself through the almost epic scales it hurtles toward. Redemption, revolution, coups, love, betrayal – this is certainly going to be a grand tale. The main (and, I’d honestly argue, only) problem with the plot is that it kicks off rather slow. The first several chapters detail how the main characters play off of one another, interact, and start developing feelings of love or, alternatively, hatred, for each another. One’s mileage might vary, but I can see some people getting rather bored or disillusioned if they expect a hard-hitting thriller right off the bat. (It’s not a thriller, either; sorry if I got your hopes up.) Another aspect of Reimei no Arcana that readers may find themselves trudging through is the politics. It is not laid on thickly, and it is not droned on about for pages at a time, but the intrigue and political affairs of the world the story is set in are still quite important. I rather think the author has gotten politics right, since I was only interested, never jaded. Due to the fairly placid pace the manga begins with, some important aspects that seem like they ought to be explained as soon as they are introduced are instead shrugged off as if they were never mentioned before. This can at times bring feelings of confusion – did I miss something or is my comprehension just awry? Not to fear, dear reader; everything will be made clear in due time. The errant way the manga tosses plot pieces and names left and right will easily be forgiven once you take a skim through after completing the manga. Speaking of which, there is quite a bit of double-meanings and foreshadowing in certain characters’ words, expressions, and actions. It’s quite pleasant to see how much the author truly had planned in advance and see that reflected in the manga itself. Our main characters are Nakaba, Loki, and Caesar. Nakaba is the red-haired first princess of Senan, sent as a “sacrificial goat” to Belquat. She is not the shy, weak-willed, and insipid girl that so often plague shoujo manga; in fact, she is self-righteous and knows what she wants. She does not let her husband bully her around, nor does she wallow in despair for being segregated based on her hair colour. She stands above this. She is, however, very much resigned to her fate. As she herself says, only the place she will die has changed by moving to Belquat. At first, she has little interest in bettering herself. This changes, and she becomes an ambitious and motivated woman, and at times even ruthless when it comes to completing her ultimate goal. Her servant, Loki, is an ajin, a man bearing the traits of a dog. Quiet and loyal, he attentively sees to Nakaba’s every need and ensures her safety. He serves to his princess’ every whim quite selflessly. Then we have Nakaba’s husband, who is none other than Caesar, the second prince of Belquat. He might as well be the exact opposite of Loki; completely unimpressed with the idea of marrying a red-haired princess, he at first treats Nakaba quite poorly and obviously wants little to do with her or her sub-human servant. However, due to a series of events that leave him introspective, he finds that he is quite “hollow”, and decides to try to change this. While some characters’ actions make them seem extremely unlikable and vexing – case in point, Caesar – they are also understandable. The society they live in, along with their completely outrageous taboos (as we see them), would naturally warp their personalities in such ways. As such, while I do consider some actions to be very much deplorable, I can also see the reasoning and logic to those actions. That brings me to the most wonderful part of Reimei no Arcana, which is easily the fact that every single character has their own motivation. While it’s easy to see what characters you should like or dislike, there’s also the aspect of morality. If you were a blonde prince, wouldn’t you resent your younger brother for having black hair, and thus being immediately more favourable for the throne in the eyes of your own peers? Too often in manga are characters just cardboard cut-outs with a name and a few traits pasted on. Most of Touma Rei’s characters don’t even fall into complete archetypes (apart from the couple tsundere male characters). A good chunk of them feel realistic enough to stand on their own outside of the manga. Special shout outs go to Cain, Louise, and Guren. The other characters of Reimei no Arcana are given adequate panel time. As is the case with any manga, some are more developed than others, while a few select characters overstay their welcome. Overall, though, none of the characters are “filler”; all serve a purpose to the plot and the storyline and most get their chance to shine, one way or another. A few characters depict a subtle but welcoming character progression that can only completely be appreciated by flipping back to their first appearance and forward to their final one. There are a few characters that seem to be forgotten and set aside (for example, Leo and Lala), although this can be forgiven due to the calamity of events that occur in their absence. Despite my praises, I do have some gripes with the characterization in this manga. Namely, my main issue is how quickly Nakaba forgives Caesar’s original treatment of her. In fact, it’s difficult to call it “forgiving”, since she nearly goes on as if it never even occurred. I do believe that a few more chapters detailing her inner turmoil of her feelings and her dignity as well as her empathy for the prince of Belquat would have been helpful in providing some more flesh and realism to the story. Same goes for Caesar, too – while we do have some more insight into his feelings regarding Nakaba, he wasn’t exactly the victim (regarding the two of them), and he wasn’t the one getting his hair pulled or his name spat upon. Touma Rei’s backgrounds are fairly lacklustre and most leave details to be desired. It’s generally the most “important” aspects (such as the bricks of a wall and the arbitrary desk and chair) that are sketched out in the bare minimum. This is a fairly prevalent issue in a lot of shoujo manga, but I felt it necessary to mention anyway as it does end up affecting my overall opinion of the mangaka’s artistry. Touma makes up for her mediocre backgrounds with quite detailed clothing and character designs. She definitely knows how to draw good looking men and women, even if there were a couple guys I mistook for women at first sight. In retrospect, this was likely on purpose. There is fairly heavy screentone usage in the manga, primarily for shading, clothing, and hair. Since there is some action in Reimei no Arcana, it’s worth noting that, for the most part, the panels are clean and clear. I only found myself confused at what was happening during action scenes in the first few chapters, and this is mostly due to a distinct lack of detail in the drawings. It could be said that this was on purpose (and by that I mean the details, not the confusion). I’d highly recommend this manga to anyone looking for something just a bit different. Reimei no Arcana is an intriguing shoujo manga that, for me, was able to blend several genres together – romance, mystery, fantasy, and drama – quite well, and delivered a truly stomach-punching ending that will definitely remain in my mind for a long, long time. This manga made me laugh, it made me cry, and it made me hopeful for a brighter future, both in Nakaba’s world and in mine. I'm pretty meticulous when it comes to choosing what to read, since I hate leaving things unfinished. Hence I went into this manga with eyes and ears open, having read a LOT of reviews. I thought I knew roughly what to expect, but without having particularly high or low hopes. Boy was I disappointed. Obviously this is a cliché story about an unwanted princess who is forced to marry the enemy kingdom's prince for the sake of peace. The princess discovers she has an innate ability that gives her enough power to take control of her life and kingdom. It's incredibly cliché, which would be okay if her development was executed well. But the story is... stupidly simple, only made to appear complicated. Even the princess' power - the Arcana of Time - is loosely defined in the first place, and complex actions that would be near-impossible in real life are overly simplified - like (SPOILERS!) the act of simply "giving" an entire country to someone else, or migrating an entire race... I mean, at one point our heroine princess even has two husbands through some bizarre logic made up for the sake of the plotline...!? (/SPOILERS!) It's convenient writing for the sake of complicating an incredibly basic plot line that wouldn't have any direction or closure otherwise. The cast is as cliché as they come. I wasn't a big fan of the princess, but she was bearable and a host of minor characters kept me mostly interested. Loki, the princess' battle butler, was probably the main reason I kept coming back to the manga despite all my obvious issues with it (and I actually shipped the prince with the princess, not Loki). As a character he's written very tragically and right from the get go it's hard to tell who commands his true allegiance. Is it truly to the princess, who he protects with his heart, body and soul? There's a LOT of convoluted drama involving him, which crops up again and again throughout the story. While he doesn't necessarily appear to develop, I wasn't disappointed and liked the conclusion to his character development. I would suggest you only read this manga if you are drawn to Loki's story, but THAT in itself would be cruel - I know a LOT (if not most?) of readers have had an issue with his storyline. It's usually pretty decent. Being nit-picky... a couple of characters look similar (Caesar and Adel, anyone? ), the fight scenes were badly done, and there were some weird character design choices. But yeah: usually it's pretty decent, and the cover art is gorgeous. I'm being pretty harsh, especially considering the story, art and character ratings I've given so far in this review, but I can't in good conscience give a higher score. This is probably the worst manga I've ever read. As somebody you already read the manga I have to say that I never read a manga like this! When I started I thought this will be the usual "They hate each other then they will fall in love and everybody will be happy..END". THIS IS NOT THAT TYPE OF MANGA! There were many twists and shocking events. If they would not start with such a cliche then I would have given 10/10 for sure. But even like this I love the whole story. When I thought I know the final out come the author slapped me and I was in the dark once again. It's really great. And at the end...I seriously cried a river! It was so shocking. I can't say much about the art just that it is Perfect. It made the manga even more enjoyable and all of the characters (even the ver very side characters) were detailed. As the manga starts it's not so special but in this case I would say the character development is the most important. How Princess Nakaba becomes strong, how Prince Caesar becomes less tsundere-ish (lol) and how Loki changes. Even the side characters have background and we can get know them a little bit. Most of the time I decide what point to give to a manga or anime based on the enjoyment. After starting I couldn't stop to read this manga. I have nothing to say just that it's FANTASTIC! Although there are parts that's predictable it is definitelly worth to give a shot. If you are looking for a lovey-dovey manga, I suggest you not to read this. Although the bond between Nakaba and Caesar are really beautiful and some of their interactions are sweet, overall the manga is not about this. I would recommend this manga for those who like to see how the characters develop and for those who don't like predictable mangas. It also stands on its ground as a historical manga so ppl who like that stuff could try this too! Wow. I wasn't expecting this, but then again, I almost never am. Whenever I get into a series, I was go in with an expectation that seems to have nothing to do with what actually happens. I saw this on a list of shojo arranged marriage mangas, and after reading Hapi Mari, I was wondering if there were any more with that dynamic. I got here and realized that while it did have elements of that in it, the plot really doesn't focus on romance at all. So if you were here for that, prepare for an actual plot. The story is very good. I liked the world building and the unique setting, along with the important messages on discrimination. Sometimes it seemed unfinished or disconnected and seemed to drag, but it went well in the end. Most of the time, mangas can't make me cry (unless I've seen the drama or anime of it before, simply for the reason that I need moving visuals and voices most of the time, but this manga managed it. I cried throughout the last volume especially, though I also cried during some tragic romance moments (while listening to Rewrite the Stars, no less). This might just be because I'm too sensitive for my own good, though. :D Other than that, it's a very interesting fantasy-war-kingdom storyline with enough angst to keep me alive. The art was gorgeous. Enough said. All the women were beautiful, men were handsome, and all of them had very different designs so they were easy to differentiate and appreciate. The author also managed to portray complex emotions just through facial expressions, which I really appreciated. The characters were good. I had a few problems with Caeser's character, simply because he fell in love with Nakaba too easily, and Nakaba with him. After they fell in love, they felt natural, however. Loki, too, was a little iffy for me. As much as I love Loki, once they revealed his true feelings at the end (let me honest and tell you that I didn't see any of that coming) it didn't really make sense in the context and the way he carried everything out seemed completely against his love for Nakaba that had driven him to do the worst from the very beginning. He claimed to (SPOILER SPOILER SPOILER) have hated Nakaba at times, but that didn't really make sense to me since he was ready to sacrifice anything for her. Maybe that was just me who felt this way. I think his character could've been given a little bit more depth. (END SPOILER). I enjoyed this way too much. There were cute SQUEEE romance moments, there were funny moments, there was enough angst to sate my angsty soul, and it served as a catharsis for me, to be honest.